I just don’t feel like writing today. This makes no sense because I love to write. However, today I just want to lie here, wrapped in this cozy blanket of summer memories, and watch the world pass me by. It has been a wonderful summer, filled with travel and family, good food, and idleness out the wazoo. 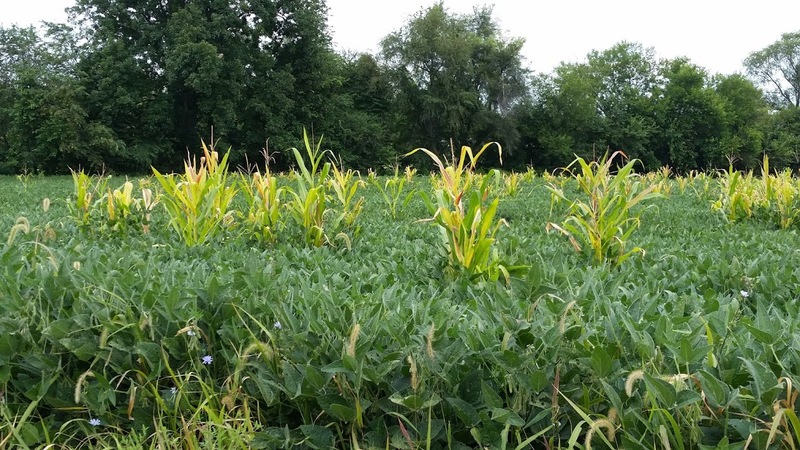 I played in the salt, hung out with Marine buddies I haven’t seen in nearly ten years, and stumbled upon a succotash field—all adventures that would not have been possible if I hadn’t left my writing chair. All the while, my trusty laptop has sat idle by my side. Sure, I checked email and played a few crossword puzzles with the thing, but I wrote only two blog posts in six weeks. I thought about writing. I pondered various blog topics. I felt inspired to write on many occasions by my surroundings. But somehow, no words actually made it to the page. Regrettably, I’ll bet that if I were to add up all the moments between actual adventures, I’d probably realize that I spent much of my summer doing absolutely nothing…staring at the miles upon miles of Iowa cornfields as we drove past, sitting in hotel rooms gazing at mindless television just because the thing was on, watching other people go about their lives. Prime, inspiration-filled writing days down the drain. 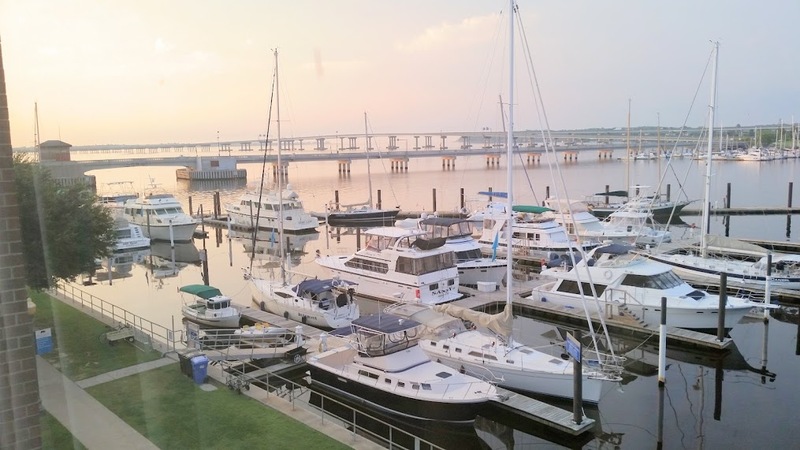 On my most recent trip to a U.S. Marine Combat Correspondents conference in New Bern, NC, I spent much of our non-meeting time looking out the hotel window at the lovely Trent River Harbor, a relaxed and peaceful boat-packed city where time practically stands still. By my third day there I’d given names to the two SCUBA divers who leave every morning on what are surely the most amazing quests I’ll never know about; to the dog walker and her Westie, who stopped to greet everyone on the path; and to the man with the bucket and hose, who moved methodically from one pier to the next, scrubbing yachts in preparation for weekend voyages. But instead of writing about them, I just stared and thought. I wasted nearly an hour one morning trying to catch a train bridge in motion. Every time I looked out the window, it would be either opened to boat traffic or closed to let a train chug across the river…yet I could never catch it in the act of rotating. I’d leave my post for only a second and, bam, it would change. I wasted more time wondering how many copies of Caged Sparrow I’d have to sell to afford a yacht of my own, what I’d name my yacht if I had one (so far, I’m leaning toward Page Turner), and wondering what I’d actually do on it because I wouldn’t want to sail it myself. I think that if I couldn’t convince my hubby to skipper the thing, I’d just keep it moored and spend every waking minute on the shaded deck enjoying the rhythmic rocking and smell of salt water while I write…or think about writing. I told myself it’s okay. You’re on vacation. You can write when you get home. But I didn’t. I kept watching the world. It feels terrible to not write, as if there’s an anchor pulling my creativity to the bottom of the river, and potential beauty is just sinking away…but I’m lying here, letting it happen. This morning, after being back four days and finding myself still in idle mode, it struck me. I’ve inertia-ed myself into a state of mind atrophy. I liked doing nothing. I liked it too much. I think our minds react to laziness the same way our bodies do, and the only way to get back on the writing track is to actually write. So here I am, with nothing special to say but the urge to say it anyway. We’ll call this blog my stretching exercise, and hopefully I’ll be back running next week. Who knows, perhaps you’re the one who will wake me up, for which I thank you in advance, or I will after my nap. Salt, Bugs, and Doughnuts: Love this Country! As promised, this is part two of our cross-country saga: The Great Doughnuts across America Tour. I could have just as logically called it “Lumpy Hotel Mattresses across America,” or “Restrooms of Questionable Upkeep across America,” or even the “Wasn’t that our Exit?” Tour, but since my travelling companion actually planned the doughnut adventure, we’ll stick with that. Yes, months before we even left Nothingbutfranchiseville, Virginia, my research-driven husband scoured every reference to doughnut shops in every major city along our anticipated driving route from San Francisco to Pittsburgh. He read reviews (particularly those that mentioned his favorites: maple bars and cinnamon rolls), whittled down lists to the highest-rated establishments, and checked their locations for ease of access, even using Goggle Earth to look at store fronts. Then he devised some mathematical sugar-to-distance formula to assess how many miles we could justifiably drive out of our way to explore establishments of particularly high grade. I know what you’re thinking. Perhaps I should call this the “Calories across America” Tour. Yes…yes it was. A mighty fine philosophy, don’tcha think? Our standard for comparison was Richard’s Donuts in Carmichael, Calif., the regional favorite of the Sacramento Oswalt clan mentioned in my last post. Over the past few years, Jerry has raved so extensively about Richard’s maple bars that I resigned to put them on my bucket list…right under “Dip a toe in the Great Salt Lake,” and before “Watch the Bay of Fundy tides change at sunset.” Aside from Richard’s nearly unforgivable spelling impairment, he seems to know what he’s doing in that little bakery of his. His maple bars are, indeed, delicious, but his crullers are melt-in-your-mouth-worth every calorie. Of course, by the time I tasted a Richard’s, I’d already experienced what we’ve since proclaimed the worst doughnut stop on our trip—a small bakery in downtown San Francisco. We should never have stopped there, 1: during rush hour, 2: straight from the airport, 3: in the afternoon, or 4: in a car. We learned some valuable lessons there that set our parameters for the remainder of our trip. To pull off the buy, Jerry had to drive around the block while I ran inside, as parking did not exist. In the store I found only a few longish things that looked like maple bars in the case, so I bought two and high-tailed it outside before our rental car made it back. Then, I held the bag on my lap until we could get out of the city, as getting out of there took some serious navigation and concentration. At last, as we drove up onto the Oakland Bay Bridge, we sighed deeply and then each took a bite of—something greasy and nearly gag-able. Neither of us wanted another bite. To make matters worse, holding that bag five minutes on my lap left a San Francisco Memorial Grease Stain on my blue capris. 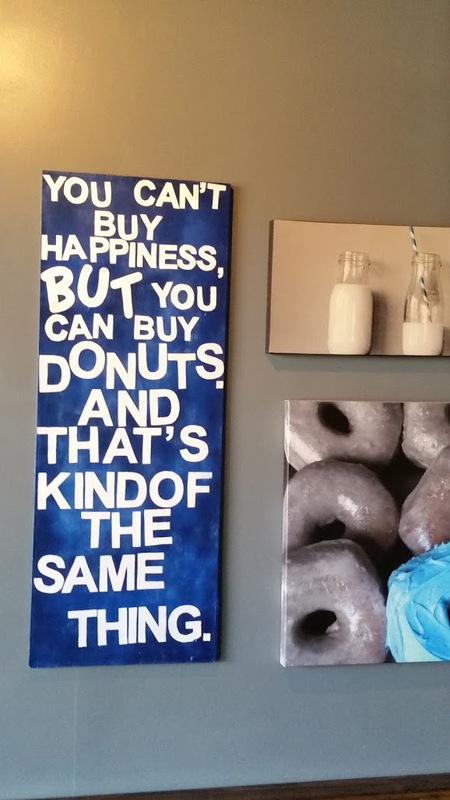 Then the doughnut tide changed for us at the Milk Run Donut Cafe in Steamboat Springs, Colorado. Once again, we arrived after the stampede, but I found a mocha-filled ball o’ goodness and Jerry hit doughnut nirvana with a maple frosted cinnamon roll. We savored every bite, ignoring the staff as they swept and cleaned around us, hinting as best they could that the place closes when inventory runs out. We stayed in Colorado a few days, also sampling Daylight Donuts in Longmont, and the Donut House in Denver. Good, but not Richard’s good. But Lincoln, Nebraska, oh my, who’d have thought? If for ANY reason you go to Lincoln, please stop at Lamar’s. Great selection, great doughnuts, melty soft goodness. I enjoyed it so much I’m wondering if I should encourage my high school junior to consider becoming a Cornhusker. I’d visit, I really would. Marci’s — So many treats, so little appetite! Even better than Lamar’s, only because it’s barely a two-day drive if I ever wish to go back, is Marci’s Italian Bakery, in South Bend, Indiana. Regrettably, by the time we reached Indiana, I was DONE with doughnuts. I walked the length of display cases just wishing I wanted a doughnut, but it wasn’t going to happen. I settled for some small cheese Danish sticks, just to experience the place, but Jerry had a doughnut and said it’s a winner. However, he was still on a high from checking off his bucket list item, a visit to Notre Dame (complete with a Touchdown Jesus sighting) and chanting “Rudy, Rudy” as if it were a theme song, so even a sardine pretzel probably would have made him smile. At any rate, I will be back, Marci. We finally made it to Pittsburgh, and on the recommendation of our oldest, visited Pastries A La Carte. It did not disappoint. Again a residual doughnut overload sent me to the cheese Danish tray. I cannot say enough good things about the cheese Danish there. The messiest, cheesiest, pastries I’ve ever tasted. I have a new standard by which to compare all cheese Danish in the future… hmmm, wondering if perhaps this calls for a drive back, this time on a Cheese Danish across America Tour? But that will have to wait, because our family is not through with doughnuts. How are the pastries in your home town? 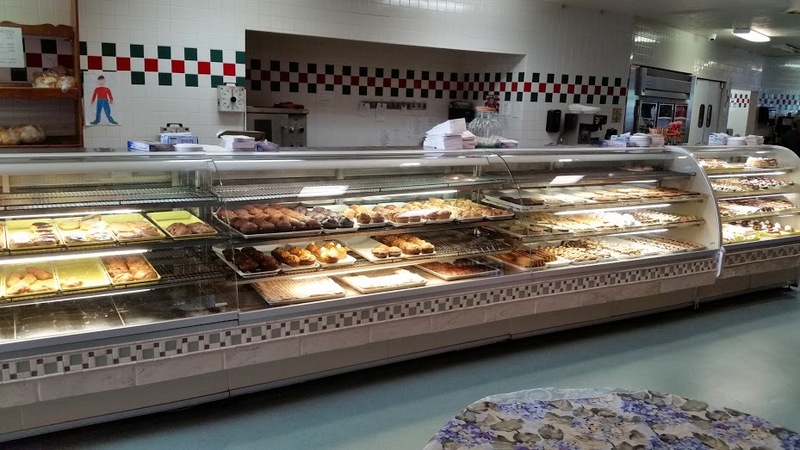 Let us know your favorite bakery and we’ll add it to our list. We’ve found two so far that give Richard’s a run for its money, but we’re willing to do way more sampling before we proclaim a winner. Someone’s gotta do it…you know, for pastry’s sake.